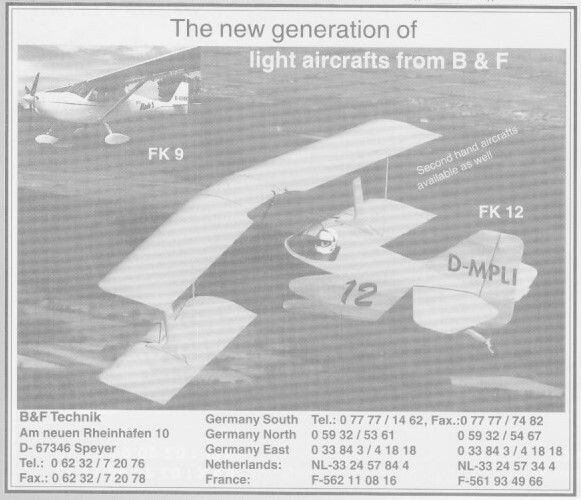 FK-Lightplanes is a product of B&F Technik Vertriebs GmbH. Production of the airframes takes place in Krosno, Poland; assembly of the airframes and the final production of the aircraft in the factory in Speyer in Germany. Otto Funk (=FK) designed in 1959 on behalf of Heinkel in Speyer the metal glider Greif 1a (FK1). This was the start of a range of light aircraft developed by the Funk family. To build the FK9 Peter Funk and Dirk Breitkreuz founded in 1990 the company B&F Technik.